Key words - Appointed as Director-General of CSIR in 1971; According to him, "Environment is not a piece of real estate; it is a heritage that we hold for future generations; it is a serious responsibility and reverence for life. "He opined that "Education is not for 'relief ' but for 'release' of potential resourcefulness in men. Education is not to make the people wealthy but the people productive, to make people an asset and not a liability." Great article on Great Scientist Prof.Y.Nayudamma. I am one of the disciples of Prof.Y.Nayudamma who was a Scientist Par Excellence,a great humanist and above all a person with Unusual tolerance. The Nayudamma Technology Bank provides easy access and information to technologies supported by IDRC — technologies from the South for the South. This collection, which provides contact names for all the technologies described, is a way of sharing and updating information on technological advancements for international development. The technology bank has been named in honour of the late Dr Yelavarthy Nayudamma, a man who dedicated his life to demonstrating how science and technology can and should be used for human benefit. Dr. Nayudamma, who joined the IDRC Board of Governors in 1981, lost his life in the tragic Air India disaster in 1985. Dr Nayudamma deeply believed in the concept of "technologies for humanity" and the need to "bring modern science to bear upon the problems and needs of the rural poor." Though internationally recognized as an organic chemist, specializing in the complex polyphenol-protein interactions upon which leather manufacture is based (in 1965 he received the K.G. 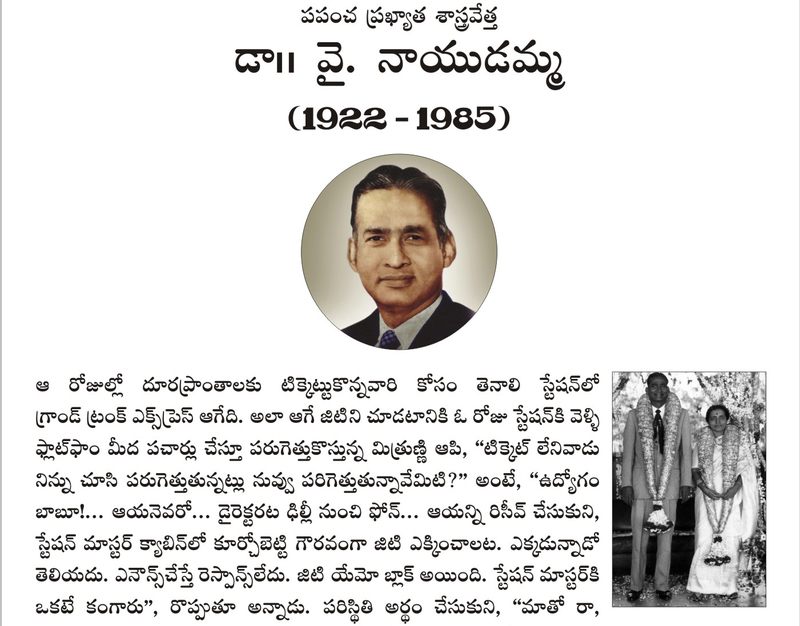 Naik Gold Medal for his research), Dr Nayudamma was ultimately a practical technologist. As director of the Central Leather Research Institute (CLRI) in Madras from 1958 to 1971, Dr Nayudamma made important contributions to the development of India's leather industry. Later he became Director General of CSIR. After resigning from DG,CSIR he became President of the Committee on Science and Technology in Developing Countries ( COSTED ), spearheading a movement for the appropriate integration of traditional and emerging technologies. Dr Nayudamma's accomplishments are numerous and varied. It is out of admiration for his vision and in honour of his memory that IDRC has named this bank of technologies for development the Nayudamma Technology Bank. Dr.Y.Nayudamma still holds the record of Youngest Director of a CSIR Lab(CLRI) at the age of 35 and Youngest Director General of CSIR at the age of 49. 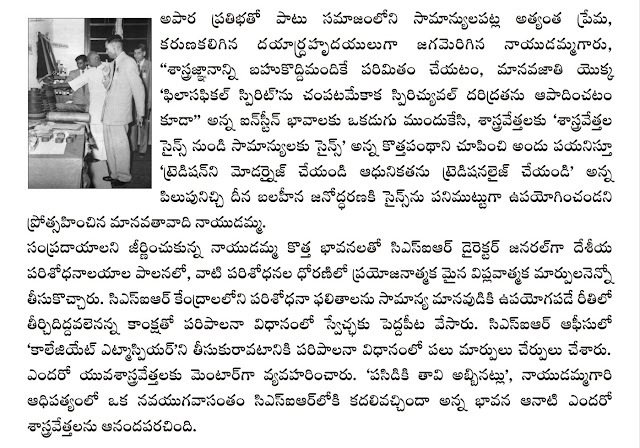 Prof. Y.Nayudamma was indeed a PEOPLE’s SCIENTIST. Our Former President Shri R.Venkataraman described “ Prof. Nayudamma was not only Scientist’s Scientist but People’s Scientist". September 10 Birthday of Prof.Y.Nayudamma.